This year’s third and overall forty-third coin from the U.S. Mint’s program of America the Beautiful quarter dollars features a reverse design that is emblematic of Minnesota’s national park. A mint mark is found on quarter obverses (heads side). It reflects where a quarter is produced with “S” for San Francisco, “P” for Philadelphia, and “D” for Denver. It can take a long awhile, but Voyageurs National Park quarters from the Denver an Philadelphia Mints will eventually appear in circulation. However, those from the San Francisco Mint are produced only for coin collectors and will no appear in change. 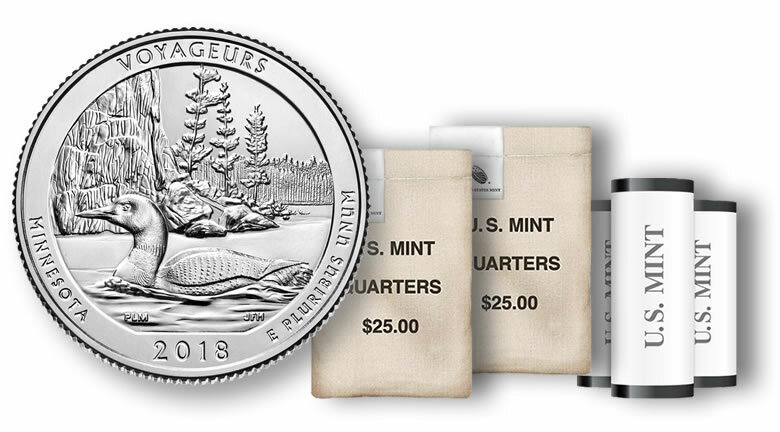 To learn more about the quarter’s design, its official June 11 release ceremony, and a U.S. Mint coin forum held on the evening before the quarter ceremony, visit our information page for the Voyageurs National Park quarter. Buy quarter rolls and bags directly from the U.S. Mint. The bureau’s page for quarter products is online here. New products launch at noon ET on their release day.